Though he looks heavy metal, the polished and shaped nails on Kevin Hernandez’ fingers out him as a classical guitarist. “This is the monster-truck version of the lute.” Kyle Patterson grins. “It’s a lot louder than your standard lute.” On his smartphone, he has a photo of a type of lute known as a theorbo propped up against a tree, somewhat dwarfing the man standing next to it. Yes, Patterson owns one. “I get gigs with that in churches,” the 27-year-old University of Oklahoma lutenist says. As quiet and retiring as a standard-sized lute himself, Patterson will be back in San Diego in April for a spotlight performance and to conduct a lute-workshop series during the San Diego Guitar Festival. “We thought it would be important to add the lute. Otherwise, there’s not a lot of call for it.” ” The multi-stringed guitar-like instrument is known for having entertained royalty during the Renaissance. The mastermind behind the classical guitar fest is SDSU student Kevin Hernandez. With his shoulder-length black hair, Hernandez looks more like a heavy-metal thrash guitarist than anything, but the polished, shaped fingernails on his right hand out him as a classical guitarist. Tucson, he says, has a vibrant classical guitar scene. Not so much here in San Diego. “A lot of these [classical guitarists] are performing in cities nearby, but they’re not coming here.” He’s not sure why but suggests that one reason might be the poverty of venues offering such music in San Diego. The U of Tucson transfer hopes this will be the first of many such concert and workshop series. “I’m trying to create sustainability for many years to come,” he says. 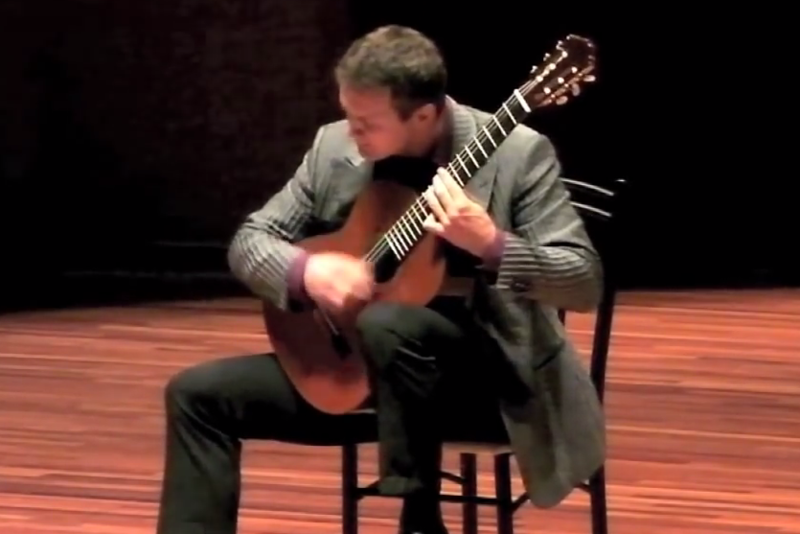 Video sample of Vladimir Gorbach's 1st prize winning final round performance in the 2011 Guitar Foundation of America International Concert Artist Competition. Hernandez’s vision is being underwritten by a $7900 Student Success program at San Diego State University, a $750 pledge from the downtown Kiwanis Club, as well as support from the Museum of Making Music in Carlsbad and the National Endowment for the Arts. The concerts and workshops (with the exception of the headlining concert at the Museum of Making Music) are free of charge and will be staged over the festival’s three days at venues around the county: the Ocean Beach library, the Coronado library, on campus at SDSU, and more. The San Diego Guitar Festival runs April 22–24. Check the event website for details: sdguitarfest.org.